Simply rotating Calculator app instantly transforms the normal calculator app into a complete scientific calculator, no visit to the App Store is required, and no additional downloads are needed. 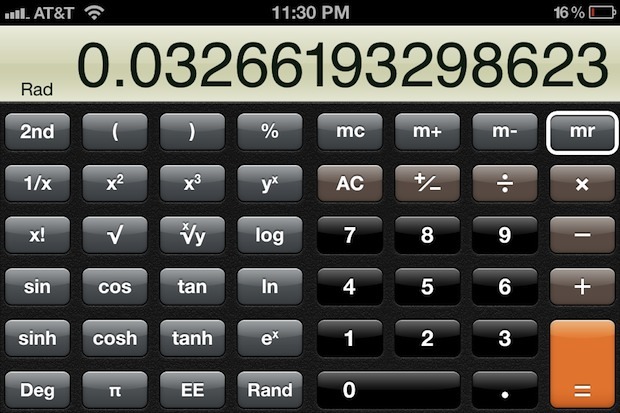 Your iphone already has this scientific calculator built right in, supported by all versions of iOS too. You can switch back to normal calculator just by rotating it back into vertical orientation. This works on all iPhone models, and it will work on the iPod touch as well, and has been around in iOS for quite some time now but apparently we haven’t posted the tip before. Thanks for sending this neat little trick in Jared! Oh, and for simpler calculation needs, recall that you can use Siri to perform some basic math too, whether adding things up, getting a percentage or return on a number, and many other math tasks. Yea, what an outrage. A website that you read posts something you already know. Riot worthy. Gosh what a lame post. That’s it, I’ve had enough of this calculator tip! I demand a refund for viewing this free website! Doh. You really are running out of material for this site. I have to agree with Chris and Max. I bet the next post will show an iPhone screen with the Calendar on it’s side showing the day view marking the present time. Your commenters are bullies. What if you didn’t know this? You should feel like a big idiot? By the way, we’re not bullies. If we were bullies, we would be out giving wedgies to little kids. It’s just that the MAJORITY of users know it. I’m not (emphasis on I’m, as in me, I don’t speak for other commenters) making fun of people who DON’T know this, but when it’s as widely known as it is it’s just better to NOT make a post about this. lol… this is funny. Maybe it should be kept to a ‘tips’ feed and not the main site. Cause I guess there are people who don’t know this, but then I am a teacher and I have students in my lowest class and they know it…. so if you don’t maybe you either need to spend more time getting to know your iOS device or you need to give it back and use Microsoft. I disagree, No one should go back to a “microsoft” product. No one deserves that kind of torture. Using microsoft is like waterboarding. I unfortunately have to develop in a .Net shop. PhySy has released PhySyCalc. It is the only iPhone calculator on the app store with units. And we’re not talking about a unit conversion app. PhySyCalc is a full blown scientific calculator that can add, subtract, multiply, divide, raise to powers, and do many other operations with numbers and units representing actual physical quantities.